I have climbed the steps that lead to the Gates of Huldah on the Temple mount and I have asked permission to visit the traditional place of her burial, a holy shrine maintained by Muslims, revered by Christians and a place of pilgrimage for Jews in the know. Perhaps her grave is the most peaceful place in Jerusalem, if not the Middle East. At least I can say that her grave is a model of interfaith cooperation, a worthy symbol for a great woman. We read in 2 Kings 22:14-20 (and Chron. 34:11-28) about the discovery of a hidden scroll uncovered during a remodel of the Temple in the time of King Josiah. After learning of the scroll, Josiah requested the prophetess Huldah to verify that it was the word of God. 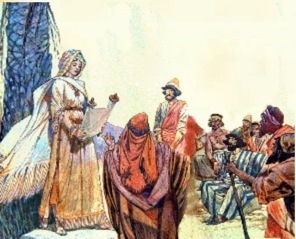 “Huldah the prophetess… holds a unique place in history. It was she who, for the first time, designated a written document as Holy Scripture. She began a process that culminated more than half a millennium later in the canonization of the Bible” (Phipps). Prior to this authorization, revelation was conceived as spoken words, a personal interaction between the prophet and God. Once a written text was deemed an authority in and of itself, revelation became a matter of knowing what was written down in the “sacred” writings. Revelation became the “province of scribes and scholars; the art of interpretation supplanted the gift of intuition” (van der Toorn, Scribal, pp.206-7). Ironically this signaled the beginning of the end of prophets and prophecy, a consequence I am sure Huldah did not intend. Many commentators have determined that the scroll was the proto-type of the Book of Deuteronomy. The earliest version of the Book of Deuteronomy is presumed by most scholars to have originated with a group of scribe-prophets between 700 to 550 B.C.E. Based on the unique way in which words, phrases and theological concerns are used in this proto-Deuteronomy, this same group seems to be responsible for many passages starting with the Book of Deuteronomy and continuing on through the Second Book of Kings. Much of this “Deuteronomistic History” involved the editing of existing documents or oral traditions. “The book is in large measure a pseudepigraph, since it presents itself as a valedictory address by Moses spoken on the eve of the entry into the Promised Land” (van der Toorn, Family, p.354). This is not to say that Huldah and her prophetic-scribal community made up a complete fiction for the purposes of deception. Rather the ancient authors conceived of literary “truth” in much the same way later rabbis would reconstruct scripture in the name of Moses. “The Hebrew Bible is the product of the scribal culture of its time; its status as divine revelation is a construct of the Hebrew scribes as well. Though the scribes did not invent the notion of revelation as such, the framing of the books as Holy Writ was their doing….The scribes and scholars of Mesopotamia, too, believed that the key texts of their literary canon were from the mouth of the gods” (van der Toorn, Scribal, p.205). The writers understood that they were entitled to speak and write in Moses’ name because they saw themselves as the continuation of the prophetic movement. Deuteronomy was written by intellectuals who consistently emphasized the need to remember, teach, and learn the law of God. “The intellectual tone of Deuteronomy is consistent, and probably indicates that Deuteronomy was written by people who defined themselves by their intellectual capacities and activity…The preoccupation with writing and with teaching in Deuteronomy, and its generally didactic tone, certainly indicate that the authors were professionals who thought about religious transmission in intellectual-educational terms” (Frymer-Kensky, Sage, p.281). Even though Deuteronomy may have been written by scribes and teachers, they were interested in disseminating their knowledge and making a nation of sages. Whatever the actual circumstances for the introduction of Deuteronomy, Huldah was given the credit for “canonizing” the book. Not only did she sanction the scroll but she also interpreted it (Camp, Female Voice, p.100). “The authority to pass judgment on this initial entry into the canon was given to a women [sic]. At the beginning of the Bible we find Huldah; in her we discover the first scripture authority, the founder of biblical studies” (Swidler, p. 783). As a result, more than just the prophet could savor and ponder the words of God; more than the High Priest in the Holy of Holies could access God. “Without Huldah’s verification of the Book of Deuteronomy in the seventh century B.C.E., Judaism might have disappeared with the next foreign invasion (which came soon enough after the scroll’s discovery). Deuteronomy can be viewed as the most complete and unified of any of the Five Books of Moses, so its verification by Huldah allowed the ancient Jewish people to make the remarkable step of creating a portable religion, one not entirely dependent on a special place or temple… Huldah’s contribution allowed the Judeans to be a ‘people of the book'” (Conover, pp.40-1). Without this paradigm shift in thinking of the holy as transportable, Judaism would have been lost during the Babylonian exile. Why Huldah and Not Jeremiah? Most biblical commentators are puzzled that King Josiah chose Huldah to read and interpret the newly found scroll since the prophets Jeremiah and Zephaniah were both active at the time, Jeremiah being the more prominent of the two male prophets. Traditional commentators reason, the male prophets have books included in the canon but Huldah doesn’t. Therefore, it is assumed, she must have not been as renowned as the men. Of course it is possible that she could have contributed to the literary tradition but her works were lost. Even if her teachings and prophecies were not put to paper, there is no reason to assume that she was not a respected colleague in the prophetic community. Phipps suggests that Huldah was consulted rather than the male prophets because she was literate. He cites the example of Jeremiah who needed a professional scribe to convey his message in writing. In addition, Jeremiah seems to have been antagonistic about the newly-found scroll. Take for example these words: “How can you say ‘We are wise men, and the Law of Yahweh is with us’?–behold, the deceitful pen of the scribes has turned it into a lie” (Jeremiah 8:8). It is widely believed that this verse is a reference to the Book of Deuteronomy (van der Toorn, Scribal, p.223). However, even if Jeremiah is referring to another scribal product, Jeremiah is certainly addressing the scribal community that produced the Book of Deuteronomy. “Jeremiah…loathed the self-confidence derived from the mere possession of a torah written by human hand and attributed to Yahweh” (van der Toorn, Family, p.364). Jeremiah could not conceive of the idea that the word of Yahweh could be contained in a book (Hyatt, p.384). Eventually Jeremiah was imprisoned (Jeremiah 37:1-15; 26; 38:2-3) and the Book of Deuteronomy became an important cornerstone of the biblical canon. Both Huldah and Jeremiah were affiliated with a priestly and political group based in Anatoth. In fact, Jeremiah was born in this suburb of Jerusalem. Under King Josiah, this circle of people were the political establishment of the time (Christensen, p.403). The Anatoth group preserved a more archaic, northern perspective of Judaism which was rooted in an agrarian value system where the genders held equal economic power and a more egalitarian socio-political authority. “Among the agrarian values they brought to the canonical process in the time of Josiah was a high regard for the place of women in roles of leadership, both religious and political. It should be noted that the treatment of women on the part of the Deuteronomic historian is simply part of a larger concern for the powerless in ancient Israel” (Christensen, p. 403). Jeremiah, on the other hand, did not share many of their views, particularly about women, evidence of which can be found in the biblical book of his name. Eventually the “men of Anatoth” plotted against Jeremiah, many of which were probably his relatives. After Jeremiah’s removal from court, the Anatoth group retained their positions in Josiah’s court and the Temple. When King Josiah called for Huldah to verify the authenticity of the scroll found in the Temple, she gave an oracle which predicted the destruction of Jerusalem and the death of the very king she was addressing. Her voice was equated with the voice of God and she spoke fearlessly and directly (Brenner, Israelite, p.60). King Josiah rent his clothes when he learned that the Israelites had not been following the divine laws proscribed by the newly-found scroll. He feared God’s wrath since the people and religious officials no longer practiced the rites and rituals of the Mosaic Law such as the observance of Passover. Instead the people worshiped “Baal and Asherah and all the host of heaven” (2 Kings 23:4). Speaking for God in her oracle Huldah stated that when Josiah died he would be gathered to his fathers and laid in his tomb in peace. Many commentators point to his death on the battlefield as proof that she was a failed prophet. Edelman argues that the phrase “he slept with his fathers” was commonly used to designate a death by natural causes. However, there is no reason to believe that the term could have been used for a violent death as well. “[I]t seems rather to be a phrase that summarizes the dying process and the proper ritual disposal of the body” (Edelman, pp.240-1). In the footnote Edelman mentions that King Ahab was also described as “sleeping with his fathers” though he was mortally wounded in battle (1 Kings 22:34,40). “[T]he statement may also imply by extension that Josiah will receive a proper, ritual burial in his family tomb in Judah so that he can have peace in Sheol, unlike his successors Jehoahaz, Jehoiachin and Zedekiah, who died and were presumably buried on foreign soil” (Edelman, p. 241). Certainly her prophecy of the destruction of Jerusalem was accurate and occurred only a few years later. Both 2 Chronicle (34:22) and 2 Kings (22:14) state that Huldah lived or sat in the newer part of Jerusalem, the Mishneh, a word closely connected to the word Mishnah, “to study.” Thus very early in Jewish tradition Huldah was seen as a scholar to whom Israelites came to for instruction. The Aramaic Targum states that she sat in a house of study (Targ. Jonathan, p.309). Not only did the early rabbis see her as a true prophet, but they understood her to be the head of a school of learning. According to the Mishnah the two southern gates to the Temple Mount were called “Huldah’s Gates,” the remains of which still hold that moniker to this day. (I of course had my picture taken in front of her gates!) Rashi noted that the gates led to Huldah’s schoolhouse. “While none of these traditions is probably grounded on historical fact, each derives from a sense that Huldah was a positive rather than negative prophetic figure” (Edelman, p.242). All told, Huldah could be described as Israel’s most successful prophet (Eskenazi, p.1284). She was successful not just because her prophecies were fulfilled and her words of religious reform were heeded. Her authority to pronounce a written document as the word of God was her greatest triumph. Camp, Claudia V. – “Female Voice, Written Word: Women and Authority in Hebrew Scripture” in Embodied Love: Sensuality and Relationship as Feminist Values, Paula M. Cooey, Sharon A. Farmer, and Mary Ellen Ross, eds. (San Francisco: Harper & Row, 1987) 97-113. Christensen, Duane L. – “Huldah and the Men of Anatoth: Women in Leadership in the Deuteronomic History” in Society of Biblical Literature Seminar Papers 23 (Atlanta: Scholars Press, 1984) 399-404. Eskenazi, Tamara Cohn – “Another View” Tamara C. Eskenazi and Andrea L. Weiss, eds., The Torah: A Women’s Commentary (URJ Press, 2007) 1284. Handy, Lowell K. – “The Role of Huldah in Josiah’s Cult Reform” Zeitschrift fur die alttestamentliche Wissenschaft 106 (1994) 40-53. Hyatt, J.P. – “Torah in the Book of Jeremiah,” Journal of Biblical Literature 60 (1941) 381-396. Parker, K.I. – – “Speech, Writing and Power: Deconstructing the Biblical Canon,” Journal for the Study of the Old Testament 69 (1996) 91-103. Phipps, William E. – “A Woman was the First to Declare Scripture Holy” Bible Review 6/2 (April 1990) 14-15, 44. Swidler, Arlene – “In Search of Huldah,” The Bible Today 98 (Nov. 1978) 1780-85.
van der Toorn, Karel – Scribal Culture and the Making of the Hebrew Bible (Cambridge: Harvard University Press, 2007).